The Walking Dead season 9 spoiler-free premiere preview: "For the first time in a long time, I'm hopeful again"
It’s no secret that The Walking Dead has been struggling to avoid the dramatic irony of its namesake for quite some time. The series has lurched from one identity crisis to the next with each new season, never quite able to liberate itself from the fetters of traipsed pacing, dramaturgic dialogue, and tired horror tropes. The Walking Dead season 8 took place in an active war zone, and even that still managed to somehow be as boring and non-eventful as an afternoon of daytime TV, which gives you an idea of just how bad it’s got in recent years. Note: This preview is purposely spoiler-free so you won’t have The Walking Dead season 9 premiere spoilt for you if you read on. However, if you want to watch it completely cold, you may want to stop reading now as we mention some minor plot details. Enter The Walking Dead season 9, which features not just the addition of a new showrunner in Angela Kang, but sees the departure of two of its biggest stars: Rick Grimes (Andrew Lincoln) and Maggie Rhee (Lauren Cohen). 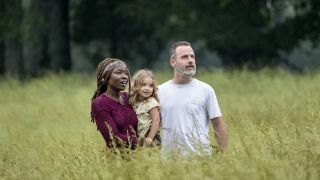 Under Kang’s vision, AMC has been publicly heralding a new era for The Walking Dead, with season 9’s creative shakeup set to redefine its very zeitgeist as a dystopian serial drama. Any longtime viewer will surely be sceptical of these promises (we’ve heard them a million times before, after all) but, having seen season 9’s extended premiere episode for myself, I want to start believing them in earnest. The change is evident from the very beginning of season 9’s premiere, aptly entitled A New Beginning. It’s not just that everything looks different (thanks to the wisely conceived time jump and swanky new opening credits sequence), but it feels different too. Kang has ushered in a more measured, humanist atmosphere, where theatrics have been traded for subtlety and exposition discarded for expressionism. "The gang’s much publicised trip to Washington D.C. ends up being this episode’s only real damp squib"
Dialogue is no longer as shouty or on the nose, for example (the absence of Negan is a godsend in this regard), as a ‘show don’t tell’ approach has segued into The Walking Dead’s stable of quieter conversations between friends, enemies, and those caught in between. As far as this episode is concerned, it’s worked wonders for the draw of character-centric scenes that traditionally has viewers reaching for the fast forward button. That aforementioned time jump has also allowed for a strong thematic and aesthetic shift between seasons. Drawing inspiration from The Commonwealth arc of The Walking Dead comics, season 9 begins with Alexandria, Hilltop, The Kingdom, and yes, Sanctuary, trying to rebuild society together, from the ground up. There’s now a strong medieval vibe to the backdrop, as horses, wagons, and agrarian machinery colour the landscape, while characters casually make reference to feudal flavoured concepts like charters, blacksmiths, and gallows. This is accompanied by a suitably Game of Thrones-esque subplot of political scheming and bloody power plays in the premiere, though to spoil the details of it here would be to ruin its value as a clear statement about The Walking Dead’s retooled approach to storytelling. All in all, it’s an inspired, refreshing change up to what we’ve seen before, and I hope it stays that way for the rest of the season. The horror-infused zombie encounters that pepper A New Beginning’s 60 minute runtime have also clearly been another focus for Kang in her attempts to rejuvenate The Walking Dead. Action shots are far less choppy than those seen in previous seasons, with former showrunner Greg Nicotero proving a much better fit in the director’s chair than the writers’ room, successfully cultivating pockets of closed tension through confident camerawork and a generally cleaner presentation. This upgrade in production value extends to The Walking Dead’s special effects, too, which have come a long way from the infamous deer scene of season 7. Wide shots of zombie-infested rivers and crow-blackened skies are painterly backdrops to the graininess of the live action footage, while one moment, which represents a devilish marriage of zombies and spiders, actually managed to genuinely creep me out through pure visual impact alone. This isn’t to say that every single one of The Walking Dead’s problems has been fixed by its season 9 premiere. I don’t think that’s even possible in the first place, but you can still detect some of the show’s recognisable flaws sprouting through Kang’s fresh blanket of creative soil. The gang’s much publicised trip to Washington D.C., for example, ends up being this episode’s only real damp squib, featuring so inconsequentially it’s as if the only reason AMC made the set change was to proudly slap Capitol Hill on every season 9 poster in existence. And while the 18 month time jump is handled tastefully for the most part, organically dripping out morsels of information for viewers to chew on, there are certain moments where expository dumps begin to stink up conversations with the smell of inauthenticity. There’s also 15 more episodes of season 9 to go, with plenty of opportunity for the show to slip up along the way. We’ve yet to know whether this season will give an effective, worthy send-off to Rick or Maggie, for one thing, but, for the first time in a long time, I’m hopeful about The Walking Dead again. It’s a strange feeling, somewhat undermined by the notes of doubt that still linger in the back of the mind, calcified by years of Walking Dead mediocrity, but the fact that I’m hopeful at all surely says something about the success of season 9’s rekindled creativity. The Walking Dead season 9 is one of our picks for the best new TV shows coming in 2018. Read on to find out what else might be worth watching this year.